WJP Studios is an art gallery in charming Cannery Row. Sculptor, Will Pettee, and his wife Karen, a fine art nature photographer, are passionate about bringing joy to others through their art – their art can add beauty to your home or office and make exquisite gifts. 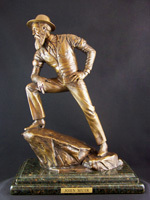 Will endeavors to capture emotions in his bronze sculptures that bring them to life for the viewer. He is a storyteller at heart and strives to tell a story in each of his works that reaffirms the human spirit. 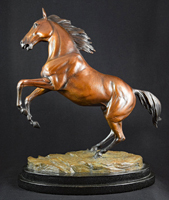 In addition, he works with clients to create personalized sculptures with remarkable precision. Karen seeks to share the beauty of nature in all of its natural wonder in her land & seascapes. She offers a variety of metal and canvas prints which capture nature's breathtaking beauty - from spectacular sunsets and waterfalls to tranquil forests and more. Please come visit us at Steinbeck Plaza on the 2nd floor next to the Taste of Monterey.